It’s good to be POTUS. While the president isn’t allowed to choose the pilot’s gender, he is allowed to confirm that the person flying the plane is in fact the sexiest man or woman in existence, a distinction held by different people from administration to administration, year to year, and even hour to hour. Affixed securely to both sides of the fuselage, these two steel polymer wings direct airflow to create an aerodynamic lift fit for a head of state. The president doesn’t have to worry if he missed the beginning of this Owen Wilson high school romp, because he can start or stop Drillbit Taylor to fit his busy schedule. Oh, yeah: It’s in stunning 1080p HD too. Total POTUS win. 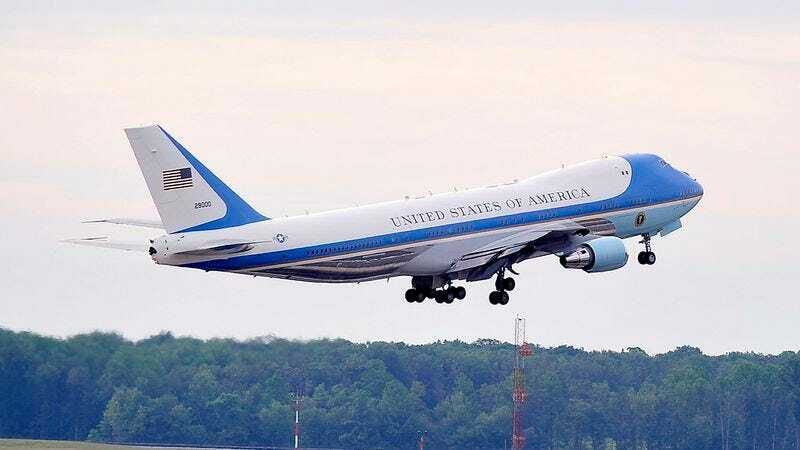 Air Force One has seen its share of upgrades as aviation technology has improved, but these historic engines taken from the very plane that used to fly James Madison around underline the importance of heritage to the office. This custom-made sign lets other sky traffic know that Air Force One is in the area and that the president is in a terrible rush. So cool! There are only 50 or so of these highly endangered Russian leopards left in the wild, so the president is lucky to have one prowling around the cabin at all times. The security on Air Force One is top-notch, and nowhere is that more evident than in the plane’s reinforced, 100 percent cloud-resistant steel hull.